(Kitco News) – European stock markets were mostly weaker overnight, pressured by banking stocks and some renewed worries about the United Kingdom exiting the European Union. Asian stocks were also mostly lower. U.S. stock indexes are pointed toward narrowly mixed openings when the U.S. day session begins. The world marketplace is anxiously awaiting President-Elect Donald Trump's first press conference since his election, on Wednesday. Already, Trump's Twitter tweets have unsettled stocks and stock sectors. The marketplace perceives that Trump wants better relations with Russia, but may take a hard line on relations with China. 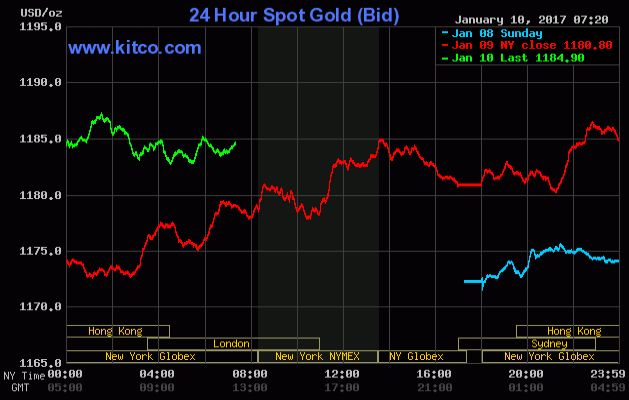 Gold prices are near steady in early U.S. trading and hovering near Monday's five-week high. Reports said demand for physical gold from China is picking up ahead of the Chinese lunar new year. In overnight news, China saw a sharp rise in its inflation rate, as its producer prices were up 5.5% in December, year-on-year, and up 3.3% from November. The rise in China's inflation rate underscores a theme of rising inflation (although not yet problematic) in many industrialized countries. The key "outside markets" on Tuesday morning see the U.S. dollar index trading slightly lower. The greenback bulls still have the firm overall technical advantage despite some choppy trading action the past week. The other outside market finds Nymex crude oil prices trading modestly higher after suffering sharp losses on Monday. Growing U.S. oil rig counts and news that Libya is ramping up its oil production are weighing on crude oil prices early this week. Nymex Crude oil finds strong overhead resistance at or near the recent high of $55.44 in February futures. U.S. economic data due for release Tuesday includes the weekly Goldman Sachs and Johnson Redbook retail sales reports, the NFIB small business index, monthly wholesale trade, the IBD/TIPP economic optimism index, and the World Bank's global economic prospects report.